In Slovenia, the level of intensification in agriculture is moderate, focusing mostly on improving labour intensity in agricultural production, i.e. reducing the input of labour per unit of area or product. 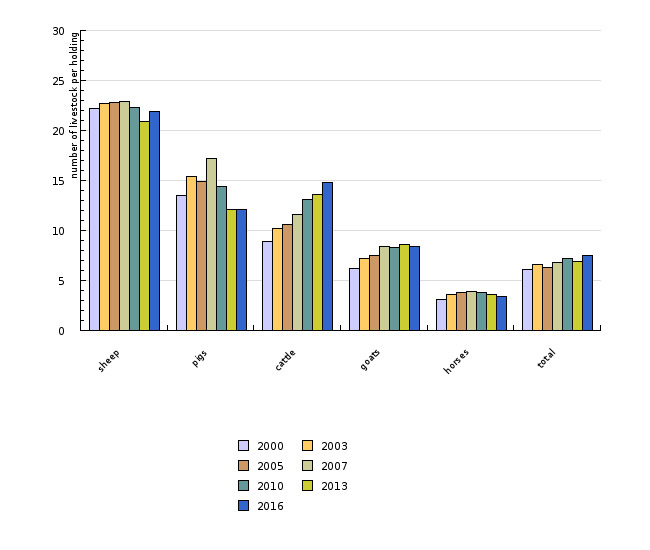 The number of livestock units (LU) per ha of utilised agricultural area as the most aggregate indicator of production intensity is stable; in the 2000-2013 period, the stocking density, as in other EU countries, slightly decreased. Due to economic pressures (market-price relationships), agricultural holdings are forced to reduce costs and increase productivity and farming intensity. 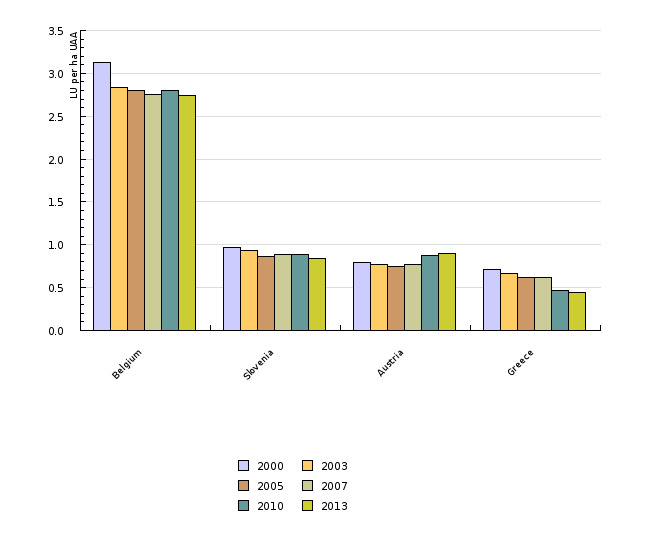 Intensity of agricultural production in Slovenia in the period 2000–2013 increased moderately. The increase was a result of the continued reduction in the number of agricultural holdings and concentration of agricultural production. Intensification of agriculture is a process that decreases production costs per unit of agricultural product. Production costs are the function of the cost of labour, land and capital. Capital-intensive agriculture develops where availability of labour and, most of all, land, is limited (Belgium, the Netherlands). Countries with limited capital and land have developed labour-intensive agriculture (India, China), while countries with limited capital and labour have developed agriculture that requires extensive land (Argentina). Each of these three forms of intensification has different impacts on the environment, nature and social structure of rural areas. 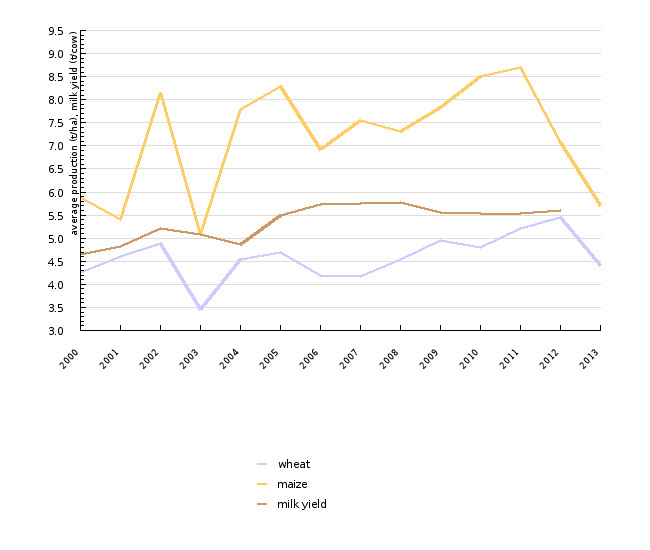 milk or wheat and grain maize production trends per hectare. Statistical Office of the RS, 2016. Statistical Office of the RS, 2013. Statistical Office of the RS, 2013; Eurostat, 2016.
safeguarding the Union's citizens from environment-related pressures and risks to health and wellbeing (7th Environmental Action Programme). The analysis of the structure of agricultural holdings shows that 80% of all agricultural holdings in Slovenia are engaged in various types of livestock breeding, 59% of which are engaged in cattle breeding. The number of farmers engaged in cattle breeding decreased by almost one fourth in the 2000–2013 period alone. According to provisional data obtained by analysis of the structure of agricultural holdings, an average Slovenian agricultural holding engaged in livestock breeding in 2016 rears 7.5 head of cattle, which is almost one fourth more (23.4%) than at the beginning of the observed period. 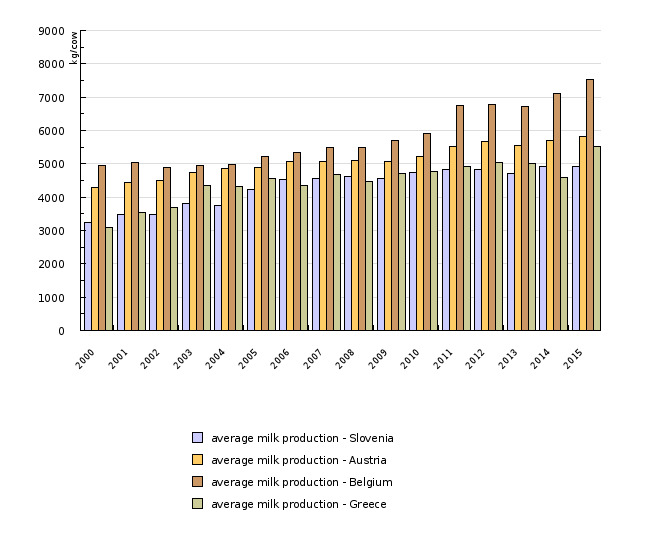 As in other EU countries, stock density is decreasing in Slovenia; it declined by 14% in the 2000–2013 period alone. At the municipal level, the number of livestock units per hectare of utilised agricultural area in 2010 shows a relatively atypical and dispersed spatial distribution of areas with different stock density. Despite a rapid decrease in the number of holdings engaged in dairying, and a slightly less distinct decline in the number of dairy cows on these holdings, the total milk yield is still growing with regular annual fluctuation. The reason for this is a notable increase in the concentration of dairying: in the 2000- 2013 period, the average number of cows per holding rose by 114%, and at the same time, the intensity of dairying increased. In the period 2000–2015, average milk production per dairy cow (milk yield) increased by 1,670 kg or 52%. With almost 5,000 kilograms of milk per cow, Slovenia is comparable to the neighbouring Austria and some other EU Member States. Wheat and grain maize are the most important crops in Slovenia. In 2013, 18,635 of agricultural holdings were engaged in growing wheat and 24,670 in growing maize. In the period 2000–2013, the number of wheat growing agricultural holdings was reduced by 41%, while the number of maize growing holdings dropped by 45%. As the total area of land under wheat production was reduced by 15% (land under maize production was reduced by 12%), the concentration of production per agricultural holding increased considerably. 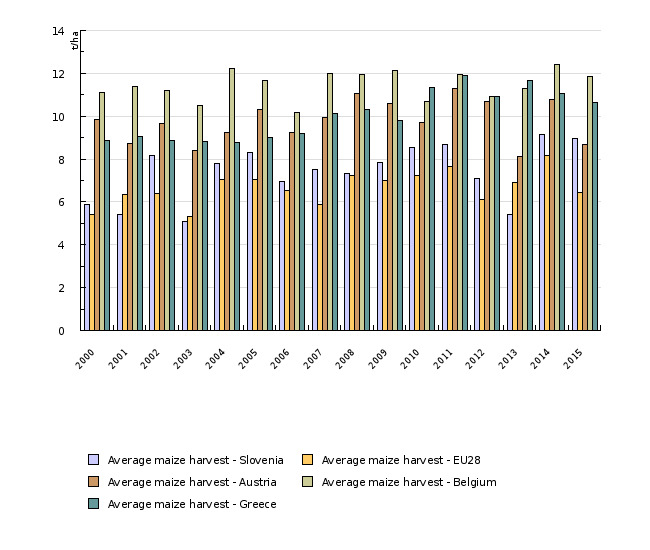 In Slovenia, the intensity of wheat production, measured in tonnes per hectare (based on long-term average), is almost 0.68 t below the EU average. 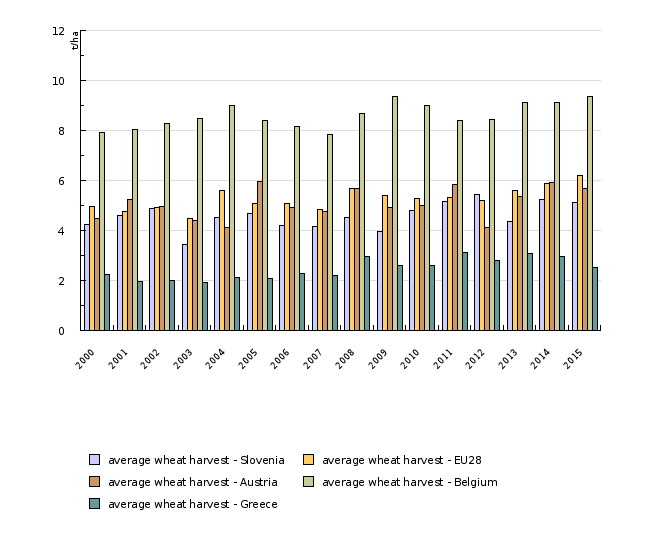 Wheat yield in Slovenia has remained constant in recent years. 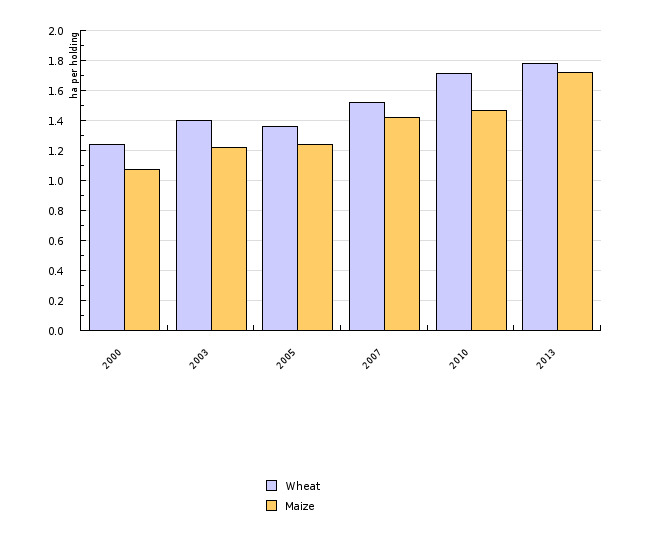 Maize yield has remained relatively constant as well, with slightly more fluctuation annually, depending on weather conditions.